Not only do we have quite a lot of friends with young kids, but we have a super curious little guy of our own. 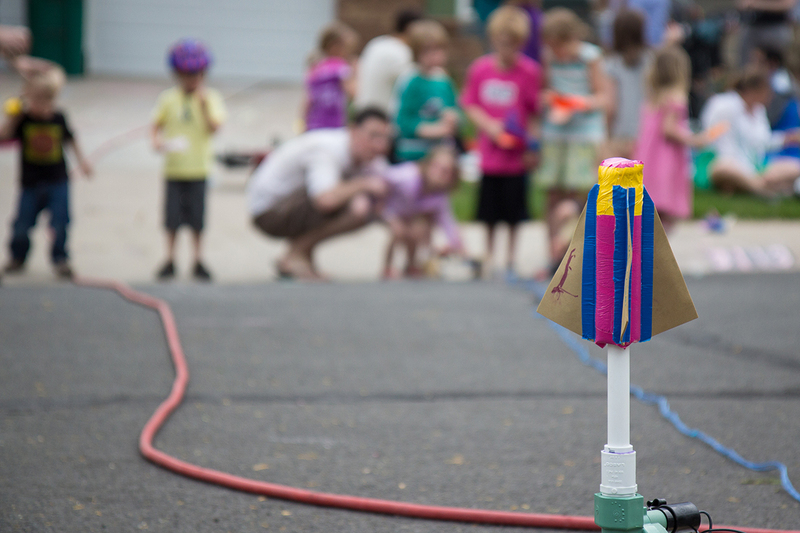 We are always looking for ways to make play dates and BBQs a little extra fun, and when I saw someone using pool noodles wrapped in duct tape as air rockets, I couldn’t wait to try it out. There are lots of designs around for something like this. 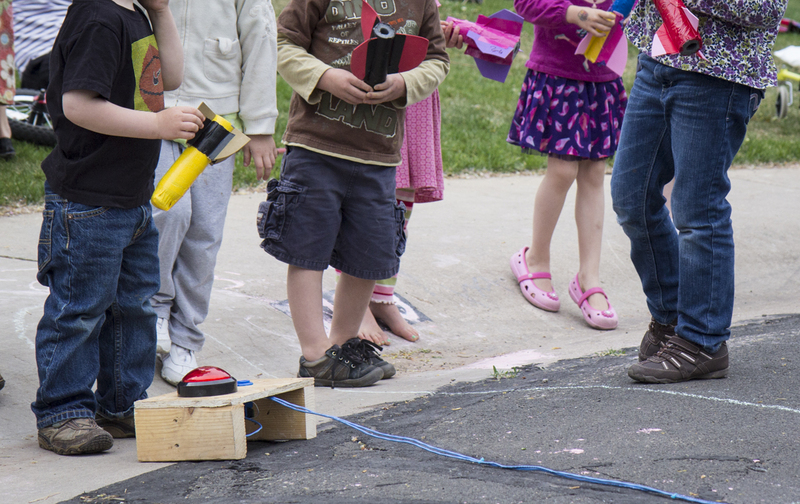 I started out with a 3″ pvc pipe for an air chamber and an automatic sprinkler valve for the dump valve, just like the air powered spud guns of my youth. One problem we quickly ran in to, and then found that there weren’t good solutions to, is that the valve tends to honk like an enormous angry goose when you launch. With a little tinkering, I found that the honking only happened after the air tank was exhausted and the flow dropped down to just what was coming through the compressor hose. I decided to try metering air in to the pvc tank to keep that lower pressure flow from happening. I had a little pneumatic solenoid valve laying around. It is an exhausting valve, so I had to add a pvc check valve between it and the tank. The local Lowes had one for a few bucks. I also put a little regulator inline to make it easy to adjust the launch pressure. For my quick and dirty control panel I used a huge red arcade button for the launch button, and a standard blue concave arcade button for the fuel button. I got both from Sparkfun for a few bucks. It works perfectly! We tried it out with some friends and their kids and it was a blast. We brought a dozen colors of duct tape and a few packs of craft foam for fins. 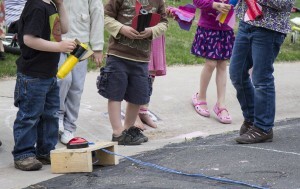 I pulled the launcher out and all the kids clamored to launch my test rocket. I thought I was going to have a little riot on my hands. Then When I told them they would be making and launching all their own rockets they looked like I had told them we were going to have Christmas again today, just for fun. 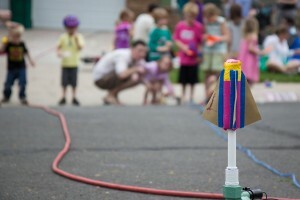 We had rockets up well over 50 feet, the dads were every bit as entertained and involved as the little ones, and we heard the kids carried their rockets around at home for days. I’ll plan on building a fancy arduino powered control panel with lights and switches and stuff later this summer. I’ll post back as I make progress! UPDATE: I built a new one!